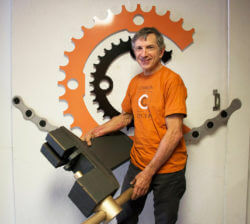 “We launched Common Cycle in a physical location this summer, with a grand opening held on July 29, 2018. LMB’s Micro-Grant was instrumental in making the space more user-friendly and welcoming for an even broader user base, beyond those who are already comfortable in a traditional bicycle repair shop setting. More recently, we’ve purchased a set of folding chairs for use in our maintenance course and other convening so that participants will have a comfortable place to sit during instruction and meeting time. This set of chairs will also help us accommodate more people to participate in our regular steering committee meetings, as well as a space for allied organizations in our community. 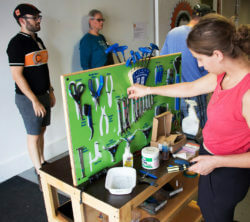 To set up our co-op over the summer and fall, we’ve had participation from a wide range of volunteers, including our board, steering committee, and regular bike repair volunteers. 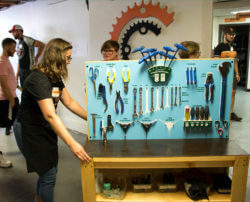 We also saw support from others not regularly involved in programming, including several people who attended our maintenance classes, and some who began engaging with Common Cycle through our Women/Trans/Femme Program. Our community benefits from a physical space where we can hold programming more frequently and throughout the whole calendar year. Compared to last year, we’ve already added more frequent Women/Trans/Femme events, and a weekly hands-on skill-building class. Furthermore, we’ve seen visitors come into our space and be able to work semi or fully independently, implying that our new setup of workbenches and organization is welcoming and user-friendly.